Aamir Khan Productions next Secret Superstar has given us yet another insight into its heart touching story line. The new poster from the film showcases a mother’s love for her children. The poster features Zaira Wasim as Insia along with her younger brother embracing their mother.The creative brings to the forefront a mother’s unconditional love for her children. The poster also features Aamir Khan, who will be seen in a never seen before quirky avatar in the film. 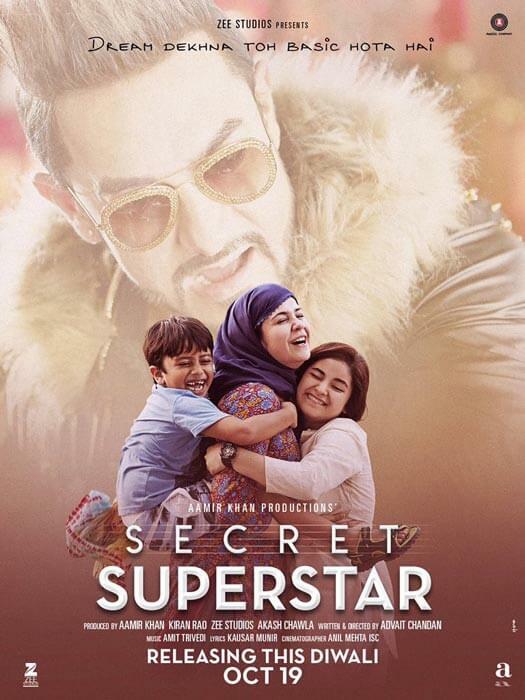 Secret Superstar is a story based on a teenage girl named Insia who sets out to follow her dream of being a singing superstar under the confinement of anonymity. The trailer of Secret Superstar shows the young girl expresses her desires to her mother, who is seen consoling and understanding Insia’s inner voice. Aamir Khan will be seen playing the role of a music director named Shakti Kapoor, who will be adding a twist to Insia’s ambitious journey. Sharing the poster from the film Aamir Khan said, “Our third poster. Love. a. “.With this, the actor also divulged that the second song from the film is all set to release today. The film’s trailer and the very first song ‘Main Kaun Hoon’ has been receiving much love from all quarters. What do you think about the new poster of Zaira Wasim’s Secret Superstar? Let us know in comment section below! The post The Second Poster Of Secret Superstar Highlights The Mother’s Unconditional Love appeared first on Koimoi. OK Jaanu’s New Poster Has Shraddha Kapoor, Aditya Roy Kapur Looking Crazy In Love! The Funny Poster Of Kapil Sharma’s Firangi Is Out!